Rob Reiner’s films have always aimed for a heartwarming effect and more frequently resulted in heartworm. Not since Patch Adams has a film more insistently aimed to convey a life-affirming sentiment and instead ended up advocating euthanasia. 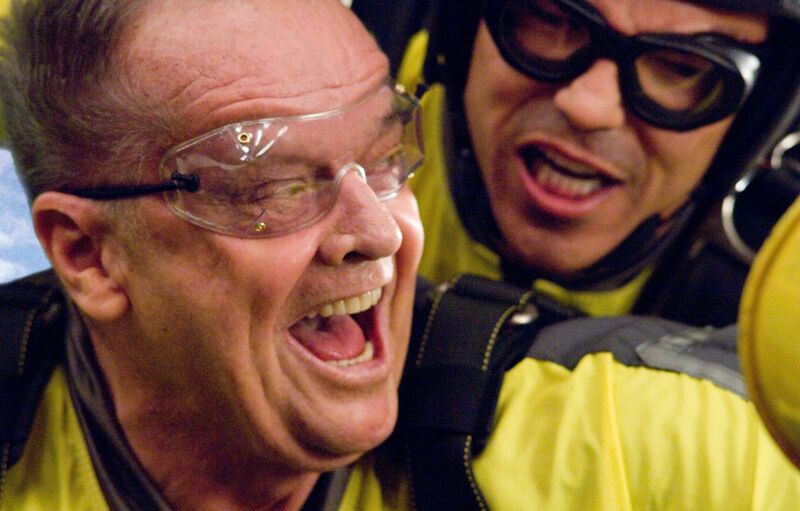 The Bucket List begins at the place where most movies move into their third act: No sooner has he coughed blood into his hankie while trying to bribe a city council and wealthy entrepreneur than Edward Cole (Jack Nicholson) is unceremoniously dropped onto the floor of a room in his own hospital. Adding insult to literal injury, he has to share his room (the city council was investigating, it turns out, alleged overcrowding in Cole’s facility) with a man named Carter Chambers (Morgan Freeman, playing valiantly against type as a perpetually bemused, sagacious old coot who was obviously dealt a hand in life a man of his wisdom didn’t deserve). Just because the audience is mercifully spared the gag of allowing the backsides of their gowns to flap open in the breeze doesn’t mean the pandering to come won’t have you heaving faster than the two patients, who are quickly informed that their conditions are terminal. Reiner’s strangely emotionless presentation of Justin Zackham’s compendium of crepuscular clichés reduces the situation of its two main characters to a shallow opportunity. While Cole splits his time either kneeling or squatting on the toilet a la South Park‘s Stuart McCormick, Carter resuscitates an old writing exercise from his college days: the “bucket list” of the title, or a list of things to accomplish before kicking the bucket. Quicker than you can say “Kodak moment,” the two of them are whisked away via Cole’s personal jet to get the fullest out of what remains of their lives. Naturally, that means they go skydiving, drive racecars, and get tattoos. This would be a gallingly bubble-headed dramatic proposition even if it didn’t require Carter, a married man, to cavalierly leave his wife of over four decades back home, frantically calling them while they sow their stale oats. Reiner’s sloppy, episodic direction dwells on neither the emotion nor the mortality that you would think would be impossible to screw up no matter how inept a director you are, but (and I say this as someone who has had cancer affect three of his close family members in just the past year) Cole and Carter still don’t kick their respective buckets fast enough.